Former Minister Gideon Sa'ar tells Yesha leaders this is the opportunity to declare sovereignty of Jewish communities in Judea and Samaria. Former Likud Education and Interior Minister Gideon Sa'ar, who has said he intends to return to politics after a two and a half year hiatus to focus on his young family, met the Yesha Council leadership on Wednesday to discuss a vision for Jewish settlement in Judea and Samaria. The meeting was held during a long day of discussions aimed at building the 'settlement vision' for the coming years. 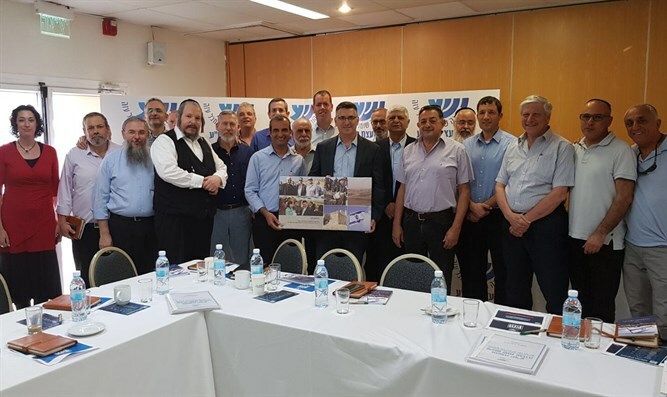 The meeting was led by Yesha Council Chairman Hananel Durani, and was attended by the heads of the municipal and regional councils in Judea, Samaria and the Jordan Valley as well as the Yesha Council. Sa'ar reviewed the changes in the Middle East and in the US government that have taken place in recent years: "The tyrannical states in our region are falling apart and the world understands that it is forbidden to allow terror organizations to control territory. There is no reason to establish another small Arab state in our region. In addition, everyone realizes that the Israeli-Palestinian conflict is not the central issue in the Middle East." "Today, Netanyahu's close relationship with President Trump has very great value," Sa'ar said. "The situation today is very different than it was, and I believe that we have a window of opportunity that allows us to formulate policies. Instead of dealing with small struggles, solving small problems, we have to begin a process that can deal with all the problems put together - the application of sovereignty over the Jewish communities in Judea and Samaria. The decision of the Likud Central Committee in December to apply sovereignty over the :settlement blocs; was the correct decision." Sa'ar reminded those present that about a half million citizens of the State of Israel live in Judea and Samaria, and, he said, "we have a responsibility towards them, to grant them rights like any other citizen. After fifty years of settlement, this has to be done. At this stage we will include only the Jewish community areas. This move will receive wide acceptance by Israeli society and if we know how to present it correctly, we will also gain understanding among our friends in the world. " "Just as the Eshkol government began to exercise sovereignty over Jerusalem, and Begin's government over the Golan Heights, now it is going to be possible to do the same. it is possible to make history and it is desirable that it be a government move like [former Prime Ministers] Eshkol and Begin."